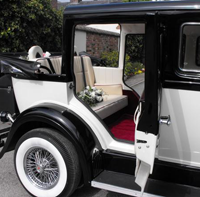 Welcome to Bermudaful Moments, Bermuda's most luxurious wedding car hire! From your first contact with our company, you will be given the very best personal attention from our event co-ordinators, whatever your occasion may be. We will be happy to accommodate your personal needs and offer as much support as required. We understand that planning a special event, be it your Wedding, Prom Night, Anniversary or a surprise for that special someone, is stressful and we will endeavour to make things as simple and worry-free as possible. We guarantee absolute discretion, reliability, professionalism, unrushed and friendly service to make your day a Bermudaful one! Our immaculate Branford Elite is the only one of it's kind in Bermuda. A classic antique Chauffeur-driven vehicle at your disposal for as long as you need. Our Chauffeur will arrive at your location in uniform making your day even more exclusive and exciting. 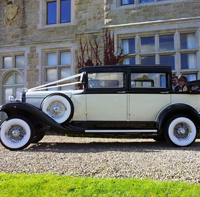 For those clients who chose our Branford Elite as their wedding car, the car will arrive on your day dressed with ribbons to compliment your wedding colour scheme. 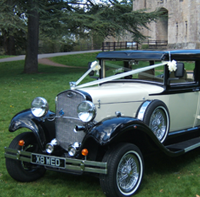 We will also supply the bride and groom with a personalised number plate which will be attached to the front of the car, showing the bride and groom's names and the date of your wedding. This will be our personal complimentary gift to you at the end of your spectacular day! What a wonderful keepsake! Our goal is to make your special occasion as Bermudaful as possible. If you have any special requests, we will endeavour to meet all of them. The Elite is also available for Executive use. Whether it be collection from the Airport or office, we will be available to welcome your guests in style! We would encourage you to complete our on-line enquiry form or telephone one of our event co-ordinators if you have any other questions. The Elite is available for viewing upon request. Bermudaful Moments is proud to introduce the Branford Elite. This brand new car exudes the luxury and class from a bygone age. A stunning hand built classic car that turns heads wherever it goes. The look, the smell, the pure elegance will capture the hearts of so many Brides and Grooms. The only question is, can you afford not to have one?